The new version 7.3 upgrade to Pro Tools is available on-line as a download, or you can buy the installation software on a DVD if you prefer not to have to download 100MB or so of files. The 7.3 upgrade can be obtained at a reduced price if you already have 7.2 HD or 7.1 LE. The boxed version includes all the other installers and extra stuff that doesn't come with the downloadable version. There's also an HD-only 7.3 update pack available through dealers, and this includes a hard copy of the printed Reference Guide. Go to www.avidstore.com/uk/index.cfm? or contact your dealer in the normal way. Having bought the upgrades and received the iLok assets for the HD version or a serial number for the LE version, you need to check that your operating system is compatible with Pro Tools 7.3. Macs need to be running OS 10.4.8. For Windows, things haven't changed so much, so XP should be OK, especially if you have Service Pack 2 installed. Remember that neither XP Media Centre Edition or XP Professional x64 editions are approved by Digidesign. As to Vista, Digidesign have announced they are working on it but as yet no date for this has been announced. I only had to update my Mac from 10.4.6 to 10.4.8, which I did with the 'Combi' updater from Apple, as recommended by Digidesign, but that triggered a whole load of other security updaters, each of which required a restart, not to mention Quicktime 7.1.3 and the latest version of iTunes, so it was not a trivial business. Digidesign advise you to check that all your plug-ins are compatible with version 7.3, but this turned out not to be that simple. Although there is a stage in the installer that is supposed to check for compatible plug-ins, it doesn't seem to be infallible, so you need to visit the compatibility information on the Digidesign web site at www.digidesign.com/index.cfm?langid=51&amp;navid=71&itemid=4767&action=news_details. 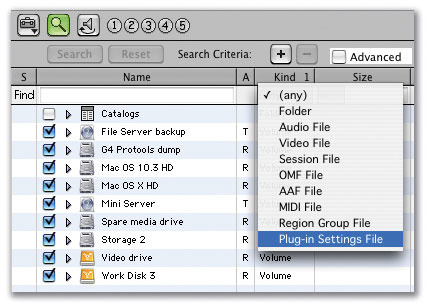 This page shows the recommended versions of plug-ins for the various versions of Pro Tools on both Mac and Windows. However, the information on this page is dependent on third-party developers providing facts to Digidesign, and I found a number of discrepancies. For example, the page quotes versions of Eventide plug-ins that aren't available even from Eventide's own site. The long and the short of it is that I spent an evening trawling for and downloading new versions of plug-ins to try and make sure I didn't have any problems. Why did I go to all this trouble? Because Digidesign say that even one incompatible plug-in will make your lovely new system unstable. I just wish there was an easier way of knowing that you have the latest versions of the plug-ins. One other point is that the Digidesign EQ II or Dynamics II plug-ins are now installed by default into the Plug-ins (unused) folder, which you will find next to your Plug-ins folder. If you need them to open an older Session, simply drag them back into your Plug-ins folder, with Pro Tools not running, and when you next run Pro Tools they will be back. Version 7.3 has brought a raft of improvements to both HD and LE versions, and also adds a number of previously HD-only options introduced with 7.2 to 7.3 LE. Let's take a tour, starting with the features that are new in both HD and LE. 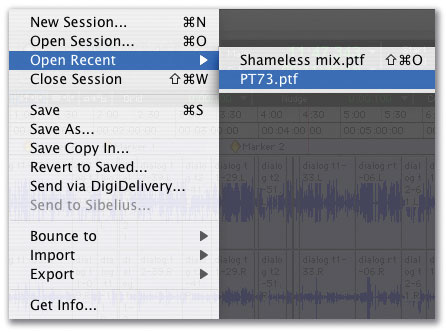 At last Pro Tools has what so many other software packages have: an Open Recent menu option. This menu stores the 10 most recently opened sessions and you don't even need to close the existing Session to use it, though you still can't have more than one Session open at a time, so Pro Tools will close the current Session before opening the next one. Finally, there is a keyboard shortcut to open the most recently used Session: Command+Shift+O (Mac) or Ctrl+Shift+O (Windows). It's so nice not to have to stop playback to add an insert or create a new track! This is a long-awaited feature in Pro Tools, especially for Logic users, who have had 'screen sets' for a long time. In essence, it stores Pro Tools window settings so you can easily switch between different combinations of windows in your chosen size, location and order. The Window Configuration can store the location and size of all open windows, including floating windows. In fact, it seems that the only window it doesn't store is its own! 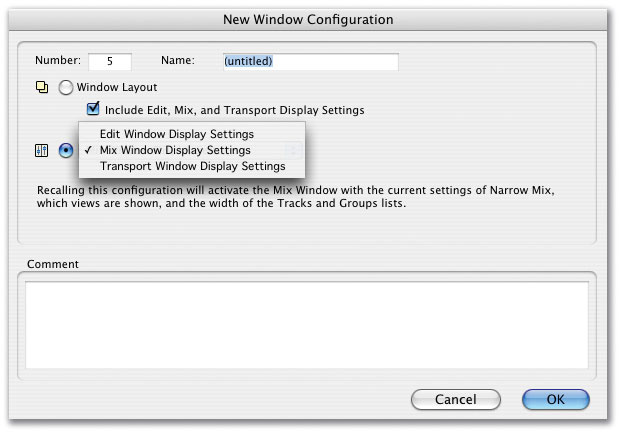 The Window Configurations option is in the Windows menu. 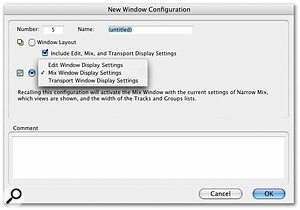 From the dialogue box you can name your Configuration and select which of the Edit, Mix and Transport displays are stored; alternatively, choosing the Window Layout button stores the details of all the windows open at that point. 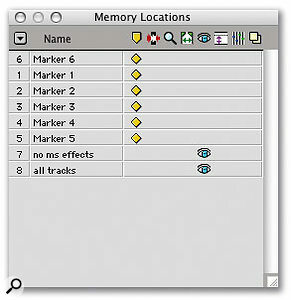 Pro Tools now has another floating window similar to the Memory Locations window for Window Configurations. It, too, has icons that tell you whether that 'memory' is a Window Layout setting or a setting that affects just one of the windows. 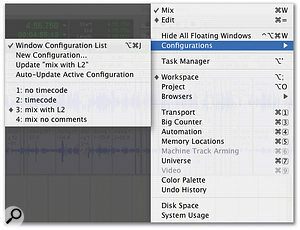 In the screenshot (centre left), the first two settings relate to the Edit window, setting three relates to a Window Layout and includes settings for all the main windows, and setting four relates to the Mix window. The Memory Locations window now allows you to filter out locators by type.You can recall your stored Window Configurations from this window, from the Configurations menu in the main Windows menu, or with keyboard shortcuts very similar to those used for Memory Locations. To recall Window Configuration 3, for example, first press '.' on the numeric keypad, then the number 3 (it could be any number from 1 to 99), then '*'. Finally, the Configurations window has a neat option that enables you to hide all floating windows with one click, or by holding down all three modifier buttons and hitting 'W'. 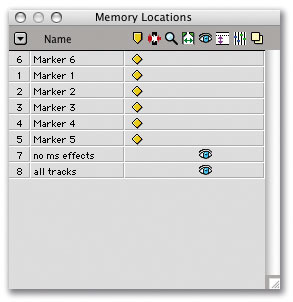 The Memory Locations window (above) has a new feature added that enables you to edit memories or filter the list to show you only certain types of memories, such as Markers or Show/Hide info. You access this from a sub-menu that appears when you click on the downwards triangle button near the top left-hand corner of the window. I found the way this filter works a little strange at first. I clicked on 'View Markers' and all the Markers disappeared, whereas I had expected the opposite to happen, so that I would see only the Markers. In fact it works the other way around: to view a particular type you need it to be ticked, while unticked options are hidden. The Windows Configuration window has a similar Edit and Filter sub-menu, too. The video functions in Pro Tools LE have received an overhaul in version 7.3, with the biggest change being that, as in HD 7.2, you can now edit the video track in very similar ways to an audio track, so you end up with video regions in the Region List. The video track now lets you add or import Quicktime video to the Timeline, as follows: Pro Tools LE and Pro Tools M-Powered let you add or import one video track per Session, with a limit of one video Playlist and one Quicktime movie on that track, while Pro Tools HD, Pro Tools LE with DV Toolkit 2 and Pro Tools Academic let you add multiple video tracks to the Timeline, with multiple video Playlists and multiple Quicktime movies per track. In all versions, you can now resize the video window simply by dragging a corner and changing it to a suitable size. This is an inspired feature that will be appreciated by all those who work to picture but don't use a separate video monitor. We will look at all the video options in more detail next month. This is another much-requested feature for any Pro Tools user who has to move Sessions between the Mac and Windows platforms. Before, you had to copy the Session folder and all the media onto a 'native' drive before you could start work on the Session on the other platform. The HD-only 7.2 upgrade enabled the support of HFS+ drives with the use of a third-party program called Mac Drive, but now Pro Tools 7.3 for Windows XP supports recording and playback of Sessions directly from Mac-formatted (HFS+) drives using the Mac HFS+ Disk Support option. You need to choose to install the Mac HFS+ Disk Support option when you install Pro Tools 7.3, but this is included free with both Pro Tools LE and HD. 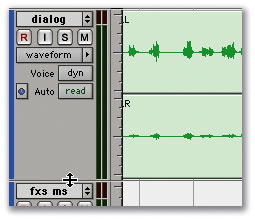 Note that Digidesign do not support recording and playback of a Session from a mixture of Windows and Mac-formatted drives. There are two improvements to Digibase browsers. The first provides new ways of previewing content. Until now, you have done so by clicking on a file's speaker icon, whereupon the file plays through once and stops. 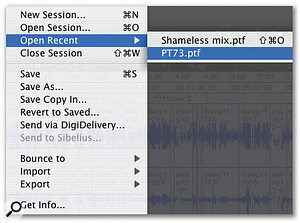 The new Loop Preview mode enables you to listen to a file looping, and it's now also possible to use the space bar or keyboard shortcuts (Ctrl+P for Windows or Command+P for Mac) to start and stop preview playback, while the Auto-Preview option enables preview playback to start automatically on file selection. The new Preview icon displays an 'A' to show Auto-Preview mode. 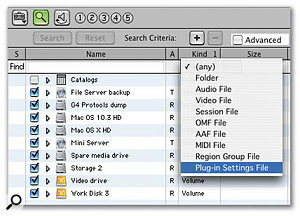 Second, plug-in Settings files now appear in the Digibase browsers, and you can now search by file type. With Digibase Pro you can create catalogues of plug-in settings and so make access to your favourite plug-in settings even easier. What's more, having found your favourite plug-in setting in a Digibase browser, you can drag the Settings file from the browser window onto either an empty insert point in the Mix or Edit window, and Pro Tools will insert a plug-in of the correct type using the settings from the preset file. Alternatively, drop the settings file on a matching plug-in and that plug-in will adopt the settings. Obviously, you can't use settings from, say, a Digi EQ III with a Waves Q10, but like with like works well. I've now created a catalogue for all my plug-in presets, and it is great to be able to search through them and then to drag them straight across to the Mix window and use them immediately. This takes the option to split the Edit and Playback selection to a new level and is a mega feature in its own right. It enables you to start playback from anywhere on the Timeline without losing your Timeline or Edit selections. For example, you can use Dynamic Transport mode in conjunction with Loop Playback mode to quickly audition loop transitions. In fact, this feature is so deep that we will look at it in more detail in next month's workshop article. You can now create a purpose-built click track from the Track menu. Pro Tools will create a new Aux track named 'Click' with the Click plug-in already inserted and the click track's Track Height automatically set to Mini in the Edit window. I only wish the click sounds were better! You can also set Pro Tools to automatically create a click track in New Sessions, via an option in the MIDI tab section of Pro Tools Preferences. 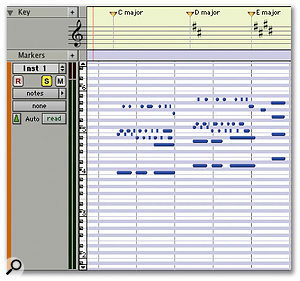 Pro Tools 7.3 includes a new Key Signature ruler for adding key signatures to Pro Tools Sessions. 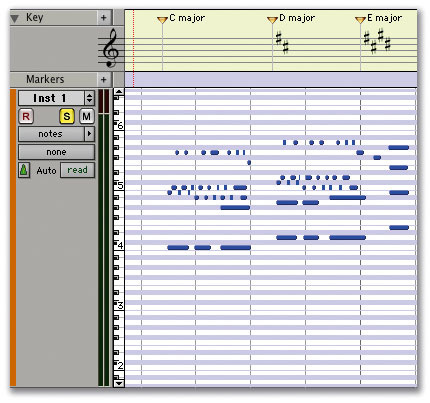 Key signatures can be added, deleted and edited, and also imported and exported with MIDI data, which is especially useful when exporting MIDI sequences for use in notation programs like Sibelius. The default key signature setting is C-major. Key signatures can also be used for transposing in key or constraining pitches to the specified key, and again, we'll be looking at this feature in more detail in next month's workshop. The 'Send to Sibelius' menu option is the first fruit of co-operation between Digidesign and their new stable-mates Sibelius Software, and enables you to export MIDI and Instrument tracks to Sibelius for further work. 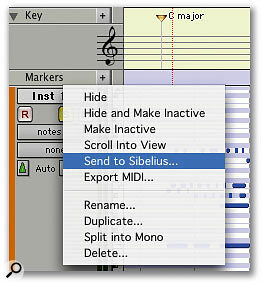 To send all MIDI and Instrument tracks to Sibelius, use the Send to Sibelius option in the File menu. If Sibelius or G7 is installed on your computer, it will launch, and you can then continue to edit the notation in Sibelius/G7 and print a score or parts from your Session. To send a single Pro Tools Instrument or MIDI track to Sibelius, you right-click the track name in the Edit or Mix window and select Send to Sibelius from the pop-up menu. 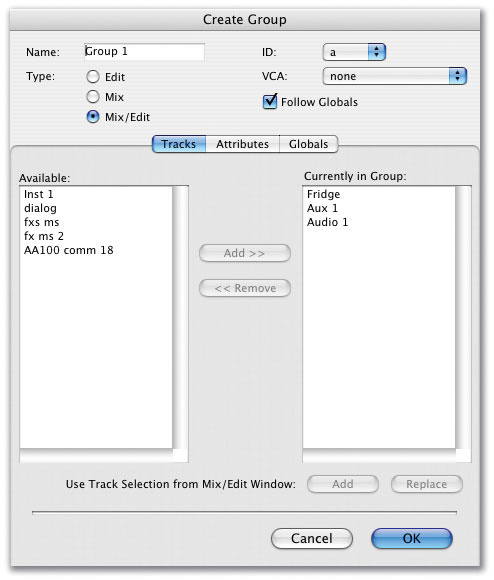 You can also send a set of selected tracks to Sibelius by right-clicking on one of the selected track names. This could be very useful if, for example, you had prepared a solo horn part using a synth in Pro Tools and you wanted to replace it with a real horn: you could send just the horn track to Sibelius and print the part for the horn player. If your Pro Tools Session uses key and time signatures, these are exported with the MIDI file and imported into Sibelius. If you have a different notation package, Digidesign have improved the MIDI Export function to include the time and key signature data. With any Edit tool selected, click a key on the mini-keyboard at the edge of the track in the Edit window. This will now select every note of that pitch on that MIDI or Instrument track. You can also select and play a range of notes on a MIDI or Instrument track by clicking on a key and dragging on the mini-keyboard. Alt+click (Windows) or Option+click (Mac) plays the notes without selecting them, and you can use Ctrl+click (Windows) or Command+click (Mac) to select or deselect notes, and to make non-contiguous selections. Shift+clicking on the mini-keyboard extends or contracts the range of notes selected. Digidesign have added two more track heights to the list of options. 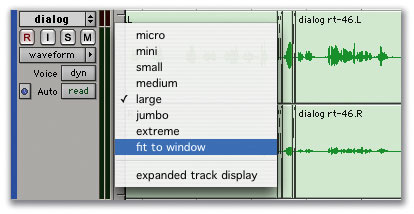 The first is Fit To Window, which changes the selected track's height to fill the complete Edit window. You can also highlight a selection of tracks and use Fit To Window to get the complete selection to fill the Edit window. 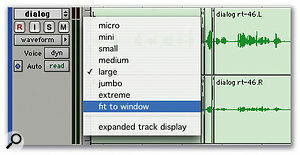 At the other extreme there is Micro, which is now the smallest track height possible and helps to give an overview of a large multitrack Session. 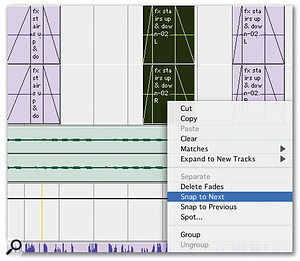 Moreover, with Pro Tools 7.3 you can now continuously resize the height of any given track by simply clicking and dragging the lower edge of the track in the Track Controls column (above), or press and hold Ctrl (Windows) or Command (Mac) while adjusting track height for continuous, non-incremental adjustments. 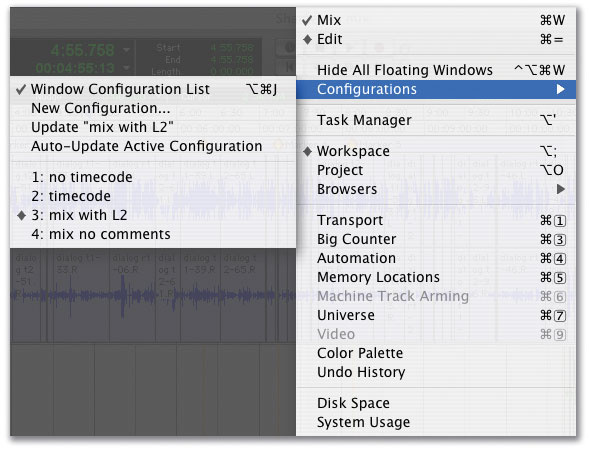 To continuously resize all tracks, use Alt+click (Windows) or Option+click (Mac) and drag. To continuously resize all selected tracks use Alt+Shift+click (Windows) or Option+Shift+click (Mac) and drag. This is so useful — I cannot remember the number of times I have wanted to be able to have a track height somewhere between one of the standard track heights. The functionality of the Zoom Toggle feature has changed and makes this feature much more reliable and usable. You can now set up what happens when you use Zoom Toggle from options and menus in the Edit tab of the Preferences window. You can also get Pro Tools to remove the selection when you Zoom Toggle in, and have a separate Grid setting when zoomed in, by checking the appropriate boxes. If you would prefer a different track height for the zoomed-in state, you can choose from Medium to Fit To Window from the Track Height drop-down menu. Audio waveforms are now displayed whilst recording in Quick Punch mode. This is great: I always missed the confidence of seeing waveforms created when I was in Quick Punch mode and so I didn't always use it when I should. Now I have no excuse! You can now preserve the relative arrangement of a Session's files stored on separate drives or in different folders when saving a copy of a Session, by checking the Select Preserve Folder Hierarchy option in the Save Session Copy dialogue window. When the Preserve Folder Hierarchy option is selected, the main folder for the Session copy will include sub-folders for each drive or folder in the original Session. The destination sub-folders will have the same names as the source drives and folders. When the Preserve Folder Hierarchy option is not selected, the Save Copy In command copies all files of the same type, regardless of location, into a single destination folder. In Pro Tools 7.3, the process of importing audio files, MIDI files, video files and Region Groups has been streamlined with new import options. 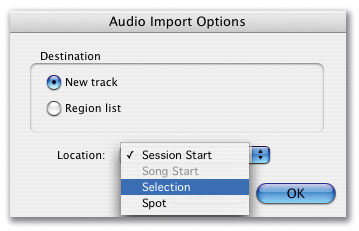 Instead of having menu options to Import to Region List and so on, you are offered a new dialogue box at the end of the process, which enables you to choose between placing the audio into the Region List or straight into the Edit window on a new track. If you select New Track, you have three choices of where on the Timeline the Region will go: at the Session start, at the selection (cursor), or 'Spot', where you can then select a timecode point it will snap to. You can also select the quality of any sample-rate conversion required. 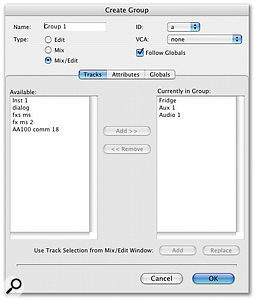 There are similar option dialogue windows for MIDI, Region Groups and Video as well. The option to import onto an existing track is still not possible. Digibase browsers have a number of new features in 7.3 LE. You can show or hide Digibase columns using Start+click (Windows) or Ctrl+click (Mac), or by right-clicking in any Digibase column label. This is long overdue, as I get fed up pushing all the unwanted columns out of the way — now I can simply hide them. 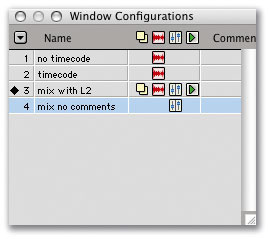 Elsewhere, the Digibase browsers also feature a number of extra fields and columns so that Pro Tools can display the extra Metadata that often now comes embedded in files created by field recorders. You can now force Digibase to re-link files that are missing from your Session if you want to be able to link to a substitute file that does not have a matching filename or Unique ID. To force re-link an audio file, its file format (WAV, SDII, AIFF or MXF), sample rate and bit depth must match those of the original file; equally, to force re-link a video file, its format (Quicktime, Avid, MXF or OMF) and frame rate must also match those of the original file. Some of the key commands for scrolling with a mouse scroll wheel have now changed. To continuously zoom horizontally in the Edit window, hold down Alt (Windows) or Option (Mac) while turning the mouse scroll wheel. Holding Alt+Shift (Windows) or Option+Shift (Mac) continuously zooms audio waveforms vertically, while Alt+Start (Windows) or Option+Ctrl (Mac) zoom MIDI tracks. To scroll the contents of the Edit window or Mix window horizontally, hold the Shift key while turning the mouse scroll wheel. One of the big developments in Pro Tools 7.2 HD was serious support for right-clicking on two-button mice, and the same right-click shortcuts have now been added to v7.3 of PTLE. There are too many to list here, but you will find all sorts of intuitive contextual menus appearing that will really streamline your workflow. My favourites so far have to be the Region menu and the Snap to Next and Previous options. Another useful one is the ability to rename an I/O path direct from the Mix window. There is a comprehensive list spread over eight pages in the What's New In 7.3 LE PDF guide. This little feature will save many a tear from being shed. In some situations, it is important to stop yourself accidentally entering Shuffle mode in order to ensure you do not inadvertently move other Regions on a track while editing. To enter Shuffle Lock mode from any other Edit mode, Ctrl+click (Windows) or Command+click (Mac) the Shuffle button on screen. A lock icon will then appear. Ctrl+click or Command+click the locked Shuffle button on screen to get back to normal. You can now perform certain Region-based edit commands and create fades whilst in automation views such as Volume Graph. The commands available in automation view include: Separate Region, Trim Region to Selection, Heal Separation and Create Fades. In addition, you can see the Fade and Crossfade shapes whilst you are in an automation view. This is brilliant, as I often get fed up of having to come out of Volume Graph mode just to tweak a fade. Two 'new' plug-ins are now bundled with Pro Tools 7.3. They are the Signal Tools signal level and phase meter — which is now called Phase Scope in the plug-in menu, for some reason — and Time Shift, a new time compression/expansion and pitch-shift plug-in. 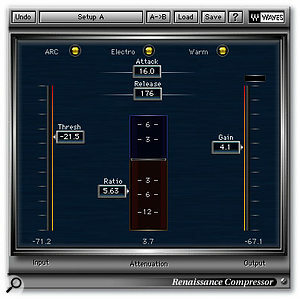 Both of these plug-ins have been around for a while, but the 7.3 upgrade finds them bundled into the main software package. Time Shift can now be set as the default plug-in for the TC/E Trim tool in the Preferences. Pro Tools 7.3 LE now allows for greater flexibility in editing Regions that contain, or are adjacent to, fades. Fades can be moved or nudged on tracks, independently of their contributing Regions. 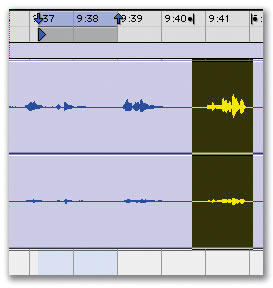 Moving or nudging fade-ins or fade-outs reveals or hides audio as the fade is moved from the edge of a contributing Region. Moving or nudging crossfades changes the overlap point of the contributing Regions. There are so many different options relating to this feature that, again, we will look at it in more detail in next month's workshop article. The Find Regions dialogue provides two options for defining a Region search in a Session. These options can be used individually or in tandem. By Name filters the display of Region names to show only those that contain the entered text, while Include Subsequently Added Regions filters the display of Region names to show only those Regions added to the Session since the previous Find command. Pro Tools LE 7.3 inherits the more sophisticated Group handling introduced in version 7.2 for HD users. 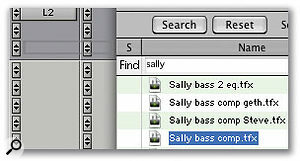 In Pro Tools 7.3 you can now have a total of 104 Groups available, arranged in four banks of 26 Group IDs. In addition, there is an expanded Group dialogue, and new Group commands let you create, modify, duplicate, delete and assign attributes to Groups (see screen top left). 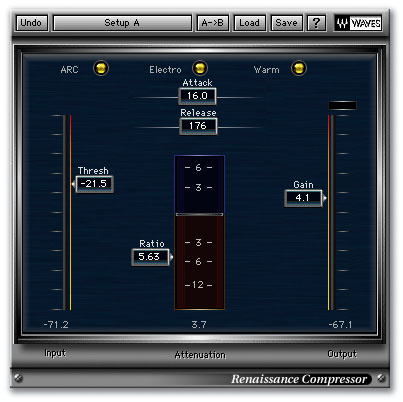 This was covered in some detail in the Pro Tools 7.2 HD review in the September 2006 issue. Pro Tools 7.3 is yet another monster upgrade, and is definitely worth upgrading to, though it would be great if the plug-in compatibility process was easier to manage — be ready to spend time downloading plug-in updaters as well as the main application. Make sure you also download the latest 'customer service' version: 7.3.1 came out very quickly and has been followed by further 'cs' revisions.